Industry lobby group Energy Networks Australia wants to ban consumers from having a solar system exporting 10kW connected to the grid. That has broad implications. Today, up to 10 million Australians can install a 10kW or larger system on their roof and export 10kW to the grid. ENA says it’s OK to have a bigger system if only for domestic consumption, but it doesn’t want that capacity being exported to the grid. Already, some individual networks want to go further. In eastern Victoria, Ausnet wants to ban anyone from having a system exporting more than 2kW (in edge of grid areas) and 5kW elsewhere. The only attempt at justification for these new restrictions – which will cut the feed-in-limit to 5kW compared to 10kW available to Sydney (Ausgrid) and Melbourne (Jemena and United Energy) residents – can be derived from comments by ENA CEO Andrew Dillon. Dillon talks about having “too much solar” on the grid, and is using a scare campaign about too much energy coming back into the system complaining about isolated “frequency and voltage disturbances”. But these can be easily mitigated. The reality is that voltage can be controlled at the substations by untying the busbars between transformers and distributing feeders based on load customer profile between them. Furthermore, across the country, rooftop solar penetration is running at a comparatively low 5-15 per cent of capacity. We are a long way from utilising all the existing infrastructure ,and even if we do meet capacity on some of the existing infrastructure there’s no reason why upgrades shouldn’t go through for the system to accept more solar. The system as it stands should be be able handle multiple increases in solar input – up to 10 times more (assuming future systems are export limited at 10kW and average 20kW) – and smarter controls could even allow for more. The scare campaign run by the ENA can probably be traced back to their interest in gas pipeline infrastructure, and the threat to that asset from increased activity from “pro-sumers” (solar and storage), and the electrification of other services such as heating and cooking, as highlighted by Shell this week. Under the ENA proposal 10kW export limits would be slashed to 5kW, this at a time when the average new solar system being installed is almost 10kW and rising. 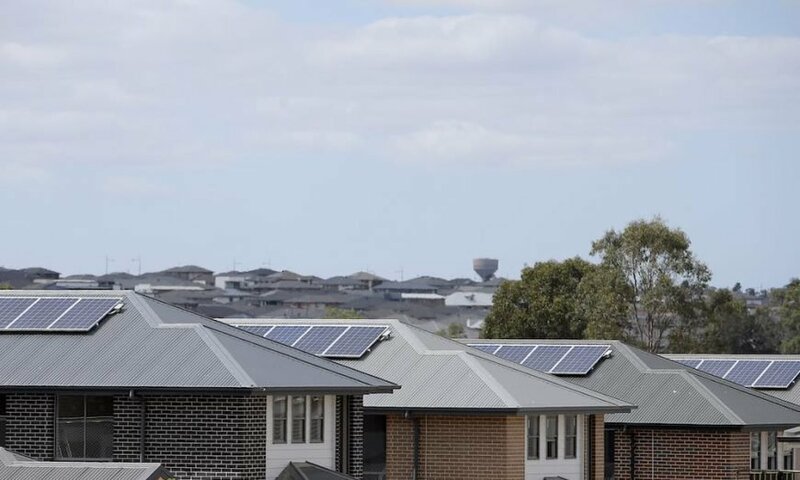 Big systems are in and big systems deliver big returns for consumers, consumers are starting to see this and have been taking the opportunity to fill their north east, west and now even south roofs with solar panels. Most of today’s houses have roofs well in excess of 100 square meters, with 200sqm being common. A 100sqm house can support up to 55 solar panels which, using the new Sunpower 400W panels, equates to a 22kW solar system. It is also worth noting that the rest of the solar industry will eventually catch up with SunPower, meaning 20 kW+ solar systems will become a common size. If a customer with 20kW of panels is exported limited at 10kW somewhere like Melbourne or Canberra it would result in up to a 12 per cent reduction in annual output. In the case that there are large loads in the home such as electric vehicle or home battery charging, to soak up excess solar production, the annual loss in production will be more like say 5 per cent. Furthermore, reduction in annual solar output due to export limiting is reduced when panels are installed in multiple aspects, which will be almost always the case in domestic situations as our roofs are only so big. To get to 55 panels on most houses will require them to be facing North, East, West and even South. In the case that that same customer (with 20kW of panels) is export limiting at 5kW, which is the ENA proposal, the lost production potential would be about 50 per cent which is very unlikely to be absorbed on-site even with battery storage, two electric vehicles and high energy use. ENA has an interest in limiting rooftop solar (most of its members are gas companies). The biggest loser in the move to renewable energy is the domestic gas pipeline and supply industry which it represents. As households disconnect from gas networks in droves and go all electric, backed with solar and batteries, ENA’s membership faces billions in asset write downs. Their aim with having solar unfairly limited the write downs will be limited. We must stand up to such efforts to put a limit and cap on the solar revolution. We must call for our political leaders to support at least a 10kW export allowance with export limiting allowing any size inverter behind the meter across the NEM. If we fail to do this we risk one of the strongest areas of action on climate and energy stalling. With governments providing little in the way of climate leadership, rooftop solar has been the bright spark in the energy revolution bringing down our emissions. ENA wants to stop this in the interest of its fossil fuel company membership who own the nation’s gas pipelines. Australian households must push back. It’s only social license that has the ENA gas industry offering even a 5kW export limit as no regulation exists today that tells them to do anything. And we know from previous comments on and off the record that the ENA’s gas pipeline owning members would like to reduce solar exports to zero eliminating solar as a threat altogether. It’s now up to the public to force the hand of politicians to choose the right export limit for the Australian public and the shift to a 100% renewable energy future. And the right export limit is 10 kW which is already accessible by millions of Australians who live in Sydney all the way through to Newcastle as well as Melbourne’s northern, north western, eastern and south eastern suburbs (and was formerly available to Canberrans and ACT was also just reduced to only 5kW of export limit). A 10kW export limit is the minimum acceptable export limit for a modern electricity grid transitioning to renewables.